We’re taking on water Cap’n! 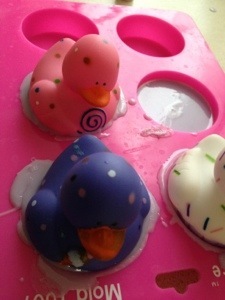 I took advantage of a burst of energy to experiment on the ducky soaps. I admit…*hanging head* I got impatient. I knew what I should do, but didn’t know how long I’d have the energy to play, so I skipped the waiting period and a few other steps. Oops! *grin* I don’t think they’re going to turn out bad, but they won’t be as pretty as hoped. The great thing is that I can remake these, so no problem, and it gave me some much needed experience in trying to attach things to soap. I made up a pretty batch of lavender low sweat soap (to make extra sure nothing goes funky on these) and scented them with bubblegum, plus the vanilla stabilizer, as an extra step to make sure they stay the way I make them. I don’t think a duck on a brown pond would be quite visually appealing. *cracking up* I waited a few minutes for the soap to set after pouring into round guest molds, but didn’t want to wait for them to nearly fully set. Plop! I eased the first duck into one of the rounds and it started to flip beak down, like it was alive and looking for a tasty morsel. That was one of the oddest sounds I ever heard while doing soaps. *grin* I finally figured out that a butter knife holds each one up rather well when balanced carefully. I still couldn’t resist taking a picture of the drunken duck though. *laugh* Rest assured that I pulled him back out, gave him a quick bath, and then helped him balance. I have 3 impatiently done ducks and then one plain soap round to experiment with using the proper techniques. I shredded some leftover soaps to use around the meeting point of the ducks to the soap that will (hopefully lol) adhere with a little clear soap and give an even more festive feel to them. I admit that I never expected to grate soap. Thank you Mom for the years of sticking me with the cheese grating duty. *grin* It came in handy. I’ll post pics of the improved versions of the ducks hopefully tomorrow. In the meantime, enjoy my unlucky duck and i wish you a steady, warm wind!